I usually bowl 4 games. Been bowling 2-handed for the first 3 and then bowl the 4th 1-handed. Didn't buy a lighter ball. Stayed with 15 LBS. I was lofting too much, so started looking at the dots just beyond the foul line and that helped me start delivering the ball into the lane. Had my first 4 bagger this morning. My high game 2-handed is 164 but that will go up as I get cleaner with my release. I'm using muscles I never knew I didn't have :-) Throwing with any speed requires muscles that are currently un-developed. It will probably take at least a year to strengthen them and get them all working together. I believe having 50 years of bowling experience really helps. Everything I do one handed still applies. I just need to get my body to do what my mind thinks it can do. My big recommendation, don't read all the articles that talk about how many injuries 2-handed can cause :-) I'm 70, I'm overweight and I'm not very flexible. I've shot 12 games 2-handed and I'm already back up to 16 MPH. Problem is, my RPM's are much higher and 16 MPH isn't enough. I can use a Tropical Storm and saw the 5 and create messengers that weren't possible one-handed. If I don't blow out my fusion surgery, I expect to shoot my first 200 in the next few games. What's wrong with this rule? Ok . Institute the rule but Jan 1,2020 should of been as of May 24,2018. Rule should be all new balls going forward will have the option to drill under new rule or current until Aug 1, 2020. Why make us drill balls under the current rules only to know we have to plug or choose a weaker layout? The current rules still apply until January of 2020. If you buy a ball now it will have to be compliant to the 3-1-1 rule and you can use a extra hole to adjust the balance. Well I drilled my new new SON!Q yesterday. I had three choices. 2 Prefered layout with no balance hole to comply with future rule. 3. Weaker layout no balance to comply with current and future USBC rule. Bowled with it last night. Ball reaction is exactly what I wanted. I agree that the 3oz rule should be instituted earlier (maybe Aug 1 so that it doesn't affect Nationals). Most of my balls have balance holes so it makes me not want to go out and buy anything until the new rule takes effect. If others have a similar mindset, that ultimately hurts the manufacturers. If you read the research articles, a few years ago, USBC was opposed to removing balance holes. Now, they're in favor. If you ask me, all of this is way too late. For all their efforts, USBC rarely does a comprehensive study before they make decisions. I'm sure between now and 2020, manufacturers will discover and make changes to continue making balls that will hook out of the building and still be legal. Eventually, USBC will discover the answer is more units of oil, longer patterns, 50 feet or more and flat patterns gutter to gutter. In effect, make synthetic lanes similar to wood lanes during the 50's and 60's. For those who are old enough, Wayne Webb was a pioneer in using dynamic weights. He took advantage of the disparity between a ball weighed on a dodo scale versus what would happen with a pancake block spinning on one side. It won't be much work for MFG's to take advantage of the new 3 ounce rule and make balls that will still hook a ton. The solution is obvious, more oil. Only problem, lane oil is really expensive. it's time to go back to the old Varnish/shellac from foul line to pin deck. Let every ball slide except for those who know how to roll. 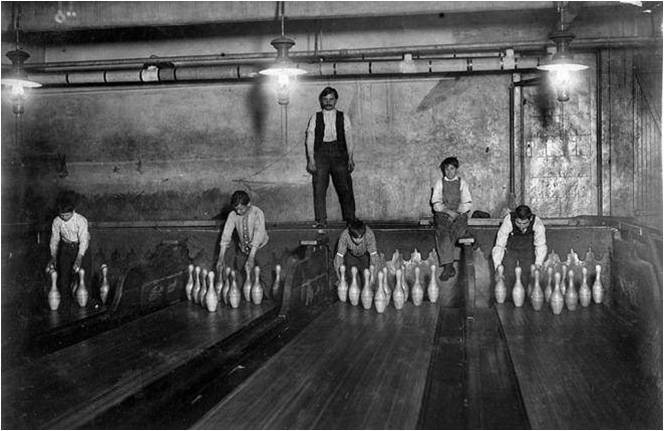 An old USA coach here once said... at his age of 87, he would bet any bowler as long as the oil was all the way to the pin deck. No one ever accepted his condition. But, he was right. Don't rely on the ball, learn to hook, learn to bowl. Look at the difference between [censored] Weber and Pete Weber. One bowled, the other banked. Haha, insert Richard. I got censored. They'll never go back for the reason they stopped in the first place, shellac and varnish are a serious fire hazard when being applied. What is needed is a new surface that's tough but slick as Teflon :-) Maybe some form of ceramic. USBC has been dancing around this issue for a long time. They can't control 98% of bowling, so they need to do something that makes them relavent. Proprietors spoke loudly about their desire to cut down on oil use, primarily because of what it does to their equipment. It's not the cost, oiling lanes is very cheap no matter the volume. The average cost of oiling is about 45 cents a lane, more or less. But the cleaning and maintenance of the setters and everything else is a task. So now it's static weights and drilling, neither of which will impact oil volumes. If proprietors wanted to use less oil, they are free to simply cut it down, as is the case in most house shots. From what I've heard, no current balls would fail the absorption test, or at most very, very few would. Ball makers probably threatened all sorts of retaliations if they went after the RG limits. Of note, three board members are in place now without a single delegate voting for them. As Jeff Richgels pointed out, they were elected by affirmation, denying delegates a choice to vote, or even protest the lack of choices. Then the PR work started online where dedicated establishment types spread fear amongst bowlers that the world would end if people didn't sanction. I have to admit he was spot on, it's an organization now that champions the art of bullying. Fact is, if people didn't need an average for tournaments, sanctioning would be far less prevalent. The mere fact that bowling has so many different views and factions makes it nearly impossible for real change to occur. The USBC cannot control the BPAA, it's proprietors, nor in any real way the ball makers themselves. The utter irony of the entire debate is that the USBC run tournaments have arguably the most laughable oil patterns out there. I think the uproar over the ball specs announced come from those that don't fully understand the minimal impact, plus a lot of folks that just see the USBC as a joke institution that has little power in reality, and is simply not functional as a National Governing Body. The vast majority of their work focus is to get more entries in their own tournaments, and try to stem the losses every year in members. When you forecast a loss of 5% to 7% of membership base every year, something's not right. The mechanic where I bowl says the lane oil is about $250 a gallon. For leagues that want a pristine condition before they bowl, it's 25 cents per person. Lane machines and repair are also high. I think the one used locally was over $100K new. Yeah, pretty cheap to lay down. I don't know any machines that are that pricey, I've seen pice lists from $20k to as much as $60k. But they sure do last a long time. I have heard from proprietors that the real cost is maintaining and cleaning the pinsetters and everything, and the more oil, the harder it is to maintain them. Most centers won't spread the oil and prefer a wall shot because that's what bowlers want, scoring. I've witnessed it enough firsthand to know to never bring up the subject again. I've become a fan of splitting up the duties. Have USBC become the NGB of the sport, and put league bowling under the BPAA or whatever. It's recreational bowling. Very similar setup to the USGA. Maybe with a small base of members, and a real job to do, the smaller USBC can be less political and corrupt.